What do Virginia Mason, the Seahawks and Safeway have in common? They’re all interested in supporting a healthy lifestyle for the community. They also have fun while doing it. With former Seahawks safety Jordan Babineaux as host, each team competed in a food product quiz, turkey bowling and a shopping spree to see who could collect the highest value grocery basket. 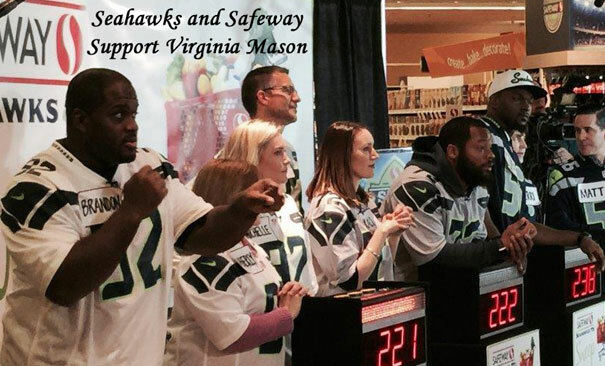 Former Seahawk, Brandon Mebane, Q13 FOX anchor Michelle Ludtka and Safeway customer Kimberly, won $30,000 for Virginia Mason’s Nutrition and Fitness for Life (N.F.L) program. Seahawk Michael Bennett, Q13 Fox anchor Kaci Aitchison and Safeway customer Mike came in second and earned $20,000 for the Hope Heart Institute. Seahawk Cliff Avril, Q13 FOX anchor Matt Lorch and Safeway customer Kerri won $10,000 for the American Diabetes Association. Virginia Mason’s N.F.L. program teaches children and their families’ healthier lifestyle habits such as how to choose foods wisely and get and stay active. Thanks to Safeway and the Seahawks for scoring a touchdown for healthy lives. Find more information about how you can help.